Preregistration for the Annual Meeting is closed. On-site Registration begins Thursday, March 7th, 1:00 PM. 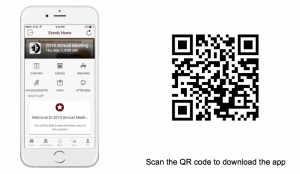 Download the Mobile Web App! To access the app from your laptop or tablet go to http://bit.ly/2ttLvto. 2019 Society for California Archaeology Games! Donate to the Auction Fundraiser! The 2019 conference location is the DoubleTree Hilton, Sacramento, California. 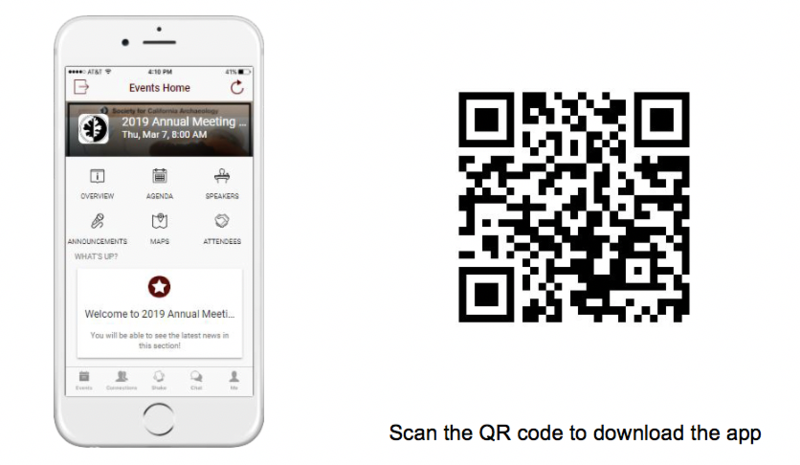 To reserve by phone, call 800-686-3775 and ask for the 2019 SCA 53rd Annual Meeting, Group Code SCA. The last day to make reservations at the group rate is February 14, 2019. The DoubleTree Hilton is ~14 miles southeast of the Sacramento International Airport. Shuttles are available from Super Shuttle starting at ~$17.00 round trip. The 2019 venue is the DoubleTree Hilton in Sacramento, near CalExpo and the American River Parkway. Sacramento falls at the confluence of the Sacramento River and the American River and is one of the most historic cities in California. Outside the venue walls, the city holds an impressive array of landmarks such as the California State Capitol, Sutter’s Fort, Old Sacramento, and the Tower Bridge. 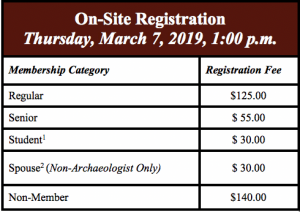 The meetings will kick off with a HUGE selection of workshops on Thursday, March 7, including Material Culture in Historical Archaeology, Rock Art Conservation, Obsidian Hydration, Clovis Identification, Underwater Cultural Heritage Resources, Legislative Awareness, and a full day of Osteology. We expect workshops to sell out quickly, so reserve your spot when registration opens in October. Saturday night will feature the Awards Banquet, with keynote speaker Dr. Amy Gusick, Associate Curator of Anthropology at the Natural History Museum of Los Angeles. Dr. Gusick’s cutting-edge research uses both terrestrial and underwater archaeology to study maritime adaptations, early human coastal migration and settlement, and the effects of environmental stress on Late Pleistocene and Early Holocene human groups along the Pacific Rim. Her talk will integrate this year’s conference theme (Women in California Archaeology) and her own work, drawing from examples of research conducted by women towards advancing our understanding of maritime adaptations. Students and others are encouraged to participate as conference volunteers for a variety of positions (e.g., registration, room monitoring, and AV assistance). Sign up to volunteer using the form on page 23 or, preferably, online at https://scahome.org/sca-annual-meeting/annual-meeting-volunteer-form/. The Plenary Session will be held on Friday morning, March 8. In the spirit of this year’s theme, we have organized a session featuring papers authored and -authored by women. Speakers will discuss a variety of topics, including contributions of women to the development of archaeological research, method, and theory, as well as new and exciting research involving gender and societal roles throughout California’s past. Friday night, March 8, the ever-popular Silent Auction will be held. This year’s event will be held at the home of the California Hall of Fame in the California Museum. The Museum engages, educates, and enlightens people about California’s rich history, its diversity, and its unique influence on the world of ideas, innovation, art, and culture. Signature exhibits include “California’s Remarkable Women,” an homage to the significant achievements made by the extraordinary women of California’s past and present, and “California Indians,” the only exhibit of its kind in the state to present the unique contributions of California’s Native Peoples in their own voice. Buses will begin leaving from outside the lobby area of the DoubleTree Hilton at 5:45 p.m. for a quick 15-minute ride to downtown Sacramento. Drop-off will be at the Museum entrance at 1020 O Street. Museum doors will not open until approximately 6:30 p.m.; guests are encouraged to take a 5-minute walk to view our State Capitol Building or head to one of many nearby restaurants for a snack or libation. Buses will be available for return to the DoubleTree beginning at 8:00 p.m. For those not interested in exploring downtown Sacramento’s nightlife, the last bus will leave the California Museum no later than 10:15 p.m. The Annual Banquet will be held on Saturday night, March 9, with keynote speaker Dr. Amy Gusick, Associate Curator of Anthropology at the Natural History Museum of Los Angeles. Dr. Gusick’s cutting-edge research uses both terrestrial and underwater archaeology to study maritime adaptations, early human coastal migration and settlement, and the effects of environmental stress on Late Pleistocene and Early Holocene human groups along the Pacific Rim. Her talk will integrate this year’s conference theme and her own work, drawing from examples of research conducted by women towards advancing our understanding of maritime adaptations. Dr. Gusick’s research interests focus on human-environmental dynamics, the development of maritime societies, peopling of the Americas, and hunter-gatherer subsistence and settlement. Current research projects focus on early human coastal migration and settlement, and the effect of environmental stress on Late Pleistocene and Early Holocene human groups along the Pacific Rim. Dr. Gusick uses both terrestrial and underwater archaeological methods in her research. Chicken and Scampi – Pesto Marinated Free Range Breast of Chicken and Garlic Prawns served with Stone Ground Mustard Sauce. Garnished with Fresh Lemon and Applewood Smoked Bacon. Pomegranate Glazed Salmon – On Basmati Rice with Mango Salsa and a Balsamic Reduction. Please be aware that all workshops are scheduled for Thursday, March 9th, 2018 and are presented concurrently. Don’t double Book! As with all chronometric techniques, obsidian hydration dating cannot be treated as a black box. The goal of this workshop is to provide insight into the theory and methods of obsidian hydration dating (OHD). It should enable the archaeologist to perform OHD analyses and the manager to ask the right questions. The workshop will cover the basic principles of obsidian hydration and the models employed in dating; how to develop an appropriate effective hydration temperature (EHT); various methods of computing a hydration rate; guidelines for data analysis; and numerous cautions. An Excel spreadsheet with numerical models for conducting an OHD analysis will be provided, and we will do some hands-on exercises. Mathematics will be kept to a minimum, but cannot be avoided entirely. Some familiarity with Microsoft Excel is desirable, so please bring your laptop with Excel. Cultural resource managers, land managers, and archaeologists are often tasked with managing, interpreting, and reviewing archaeological assessments for submerged cultural resources. This workshop is designed to introduce non-specialists to issues specific to underwater archaeology. Participants will learn about different types of underwater cultural heritage (UCH) sites and the techniques used in Phase I and II equivalent surveys. Participants will also be made aware of the 2001 UNESCO Convention on the protection of underwater cultural heritage. This workshop is not intended to teach participants how to do underwater archaeology but will introduce different investigative techniques, international best practices, and existing legislation. The purpose of this workshop is to assist non-specialists in recognizing the potential for UCH resources in their areas of impact, budgeting for UCH resource investigations, reviewing UCH resource assessments, developing interpretive strategies, and providing sufficient background information to assist in making informed decisions regarding UCH resources. Continuing Professional Education (CPE) credit is available for Registered Professional Archaeologists. A hands-on workshop designed to help archaeologists and monitors learn basic osteological identification methods. The workshop will use comparative materials to focus on defining features, skeletal anatomies, and macrostructure of bone fragments in order to differentiate between human and non-human bone. The emphasis will be on identification of bone while in the field. This workshop is based on prior lithic technology classes emphasizing Paleoindian flaked stone, as taught by Rondeau for University of Oregon summer field schools, the Bureau of Land Management, and the U.S. Forest Service. Clovis artifacts are a part of surface lithic scatters in the desert west. Such artifacts can be identified during archaeological surface surveys and contribute important information to site significance evaluations. The workshop provides opportunities to examine and discuss replicated examples of the more common Clovis diagnostics. This hands-on workshop will provide handouts, present a brief PowerPoint introduction, and encourage discussions of current knowledge and understanding regarding what is and what is not Clovis. Rock art is a resource that captures people’s attention and provides a way for modern people to relate to ancient people. However, it is also one of the most sensitive resources due to its high visibility and changing climatic conditions that threaten the stability, integrity, and aesthetic quality of the sites. In this workshop, participants will learn how to identify the transformational processes affecting rock art sites. Participants will complete a condition assessment form and collect conservation management data that will provide a better understanding of the conservation needs of a rock art site. Participants will learn about preparing a conservation management plan along with intervention procedures used by professionals to help conserve rock art sites. This introductory course provides baseline information on identifying, dating, and classifying artifacts in historical archaeological sites in California. The class focuses on four main artifact categories: glass bottles, ceramics, tin cans, and miscellaneous materials. Experienced instructors will present a combination of lectures with hands-on activities to be held at the State Parks’ State Archaeological Collections Research Facility (SACRF) in McClellan Park. Students will receive an in-class binder, a thumb drive of current literature and research in historical archaeology, and cheat sheets to use in the field. Given today’s political environment, we must all be advocates for archaeology and heritage studies. If we are not fully engaged, we run the risk of living with the consequences of our inaction. During the morning of this workshop, you will learn the ins and outs of being an advocate, including letter writing, how to visit to state and federal Congressional representatives, communicating with agency decision-makers, keeping track of legislation, and collaborating with other advocates in related non-profit organizations. We will especially focus on how to convey the value of archaeology in a way that will be understood and appreciated. You will receive a package of materials that will help you in your future advocacy efforts. Registration includes a box lunch. After lunch, we are working on setting up meetings with government officials at the State Capitol. Carpooling will be arranged prior to the conference. Lunch is included. Let’s Do Lunch pairs students with more senior members for lunch, providing students an opportunity to meet an archaeological professional and ask questions about obtaining a job, building a resume, or getting into graduate school. Pairing people at random gives students a chance to meet professionals that they might not otherwise encounter at the meeting. This also gives the senior members of our Society a chance to mentor the next generation of California archaeologists and pass along knowledge about how to be successful in the field. Let’s Do Lunch will be held on Saturday, March 8, at 12:00 p.m. (meet in the registration area at 11:45 a.m.). The SCA will arrange for a venue for the luncheon. The regular member is asked to “treat” the student member by buying them lunch. While regular members will be paired with a single student, the venue will probably seat multiple pairs together, so there will be opportunities for students to chat with more than one professional. This is a wonderful event, so please check the box in your registration packet to participate in Let’s Do Lunch. Buying lunch for a student member is the best investment in the future of the SCA. The Student Affairs Committee has organized its annual Student Mixer at the SCA Annual Meeting. The goal of the Student Mixer is to provide students an opportunity to network with archaeology professionals and academics in the California archaeological community. Students, please come and take advantage of the years of collective wisdom from our group of professionals participating in this year’s event. Come prepared to mix, mingle, and ask questions about getting archaeology jobs or internships in California, advice for creating more competitive resumes, and suggestions for getting into graduate programs. The student mixer will be held from 4:00 p.m. to 6:00 p.m. prior to the Annual Banquet on Saturday, March 8, in conjunction with a cash bar. Come one, come all to mix and mingle and provide advice to the next generation of California archaeologists. Guess the Obsidian: Ten pieces of obsidian from various sources will be displayed. Contestants guess the obsidian source by visual analysis (we will help narrow down the answers). A map of the various obsidian sources will be provided. Come test your visual acuity. Everyone tying for the highest score will be entered into a drawing for a fantastic prize. How Far Is It? : A flag will be placed on the grounds of the Annual Meeting. Contestants guess how far and how high the flag is from the datum. There will be some cool tools and technology to help you make your guess. Everyone getting within 2 meters of the correct distance and height will be entered into a drawing for an awesome prize. Shovel to Screen Toss: Test out your shovel skills. Contestants pitch a shovel with poker chips into a screen at different distances, and perhaps a head-to-head competition. How are your shovel skills? Let’s find out. Take your chances to win a magnificent prize. All proceeds from the games will be used by the SCA to help protect and preserve cultural resources. Starla Lane and Jennifer Thomas of Pacific Gas & Electric (PG&E) will be leading our fundraising team to encourage businesses and corporations engaged in archaeological work in our state to demonstrate their appreciation of the efforts of the SCA by making generous (tax deductible!) donations. These contributions will enable our Society to continue its good work in both the public and private sectors, in education and advocacy, and representing professional archaeologists throughout California. For further information, please contact fundraising@nullscahome.org. Donations can be made on the SCA website, or sent to: SCA Business Office, 1692 Mangrove Avenue, #153, Chico, CA 95926. Help! The success of the Annual Meeting and the overall health of the SCA are directly related to the participation and generosity of our members. Please consider supporting the organization by volunteering for one or more of the following: (1) volunteer as staff during the Annual Meeting; (2) provide on-site assistance by staffing the registration desk; (3) help with setup and cleanup of the Silent Auction; and/or (4) be a meeting room monitor. Sign up using the form included with this packet, or online at https://scahome.org/sca-annual-meeting/annual-meeting-volunteer-form/. Questions? Contact Volunteer Coordinator Darren Andolina at andolinadarren@nullgmail.com or at (530) 908-6713. Donate to the Silent Auction Fundraiser! The Silent Auction is an important fundraising event for the SCA. The success of this event is completely dependent on the generosity of all members of our Society. Individual members and businesses are encouraged to donate any items that will help raise money for the SCA. In the past, donations have included everything from archaeology-related products and services, to art, jewelry, clothing, fruit baskets, and beverages (including wine!). For businesses, the Silent Auction represents a great opportunity to let all attendees know that your firm is an active, generous participant within the archaeological community. Don’t forget, your donations are tax deductible! We are asking firms that donate beer or wine to the Silent Auction this year to also consider providing a non-alcoholic option, such as bottled water, sparkling cider, or soda, and to provide a few food accompaniments on their tables, such as desserts or appetizers. General questions regarding the Silent Auction should be directed to the Business Office at office@nullscahome.org or (530) 342-3537. Questions regarding the donation of goods should be directed to Gina Caretti (gina@nullfarwestern.com) or Cassie Brainard (cassie@nullfarwestern.com). We ask that businesses, institutions, and individual members support this fun and fabulous event. Be sure to bring your checkbook or cash so you can bid on the great assortment of donated goods and services. Items over $100 may also be purchased via credit card. Naomi Scher and Tod Hildebrandt have stepped up to organize the reception refreshment donations (in cash or kind). If you have questions, please contact Naomi (naomi@nullfarwestern.com) or Tod (tod@nullfarwestern.com). If you wish to host a table at this event, don’t hesitate; last year we had more potential beverage donors than we had tables! Instructions for donations of any kind may be found on the forms included with this packet. Log on to your Member’s Page at scahome.org. Non-Members: Become a Member or Register Here. Pre-registration provides significant price breaks! Identify your membership category and use the fee schedule below to determine your registration fee. 1Must provide proof of student status. 2This rate is for non-archaeologist partners accompanying an archaeologist. The Early Bird package includes the meeting registration fee, an Awards Banquet ticket, and an Auction ticket and is for Members only! The deadline for Early Bird registration is December 7, 2018. Don’t double book! The deadline to purchase Banquet and Auction Tickets is Wednesday, February 16th, 2019. The deadline for electronic registration WITHOUT Silent Auction or Banquet tickets is February 28, 2019. A Note on spouse memberships and registration: The SCA Executive Board has elected to discontinue the Spouse membership type. 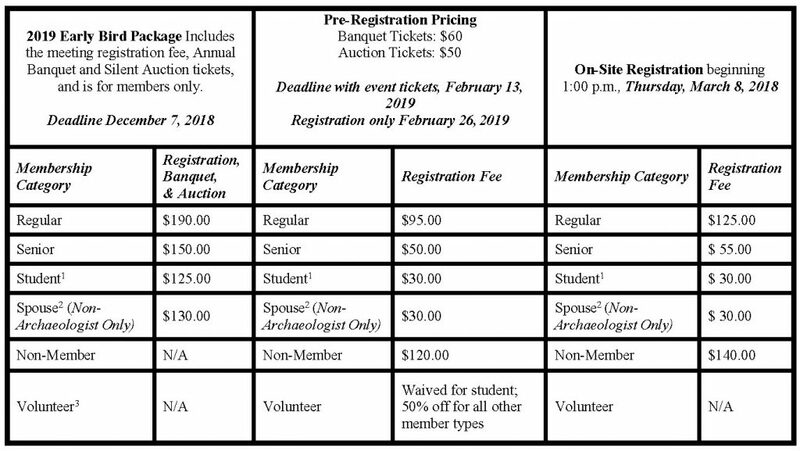 If you wish to bring your non-archaeologist spouse to the meeting, you may take the spouse/significant other rate without that person being a member of the Society. Professional archaeologists may not take the spouse rate. If You Plan to Volunteer: The volunteer registration fee waiver is only for SCA members. You must obtain volunteer waiver during the pre-registration period.